In this class, we will continue working with the Web we created in FrontPage 101 and 102. We will spend this class learning how to create Tables in our Web pages. Tables can be used for two purposes: displaying data and laying out your pages. We will see both uses in action. We will begin today's class by looking at tables - learning about the parts of a table such as columns, cells, and rows. We will learn what tables are used for, and how they work in your Web pages. Next, we'll learn how to insert tables into our web pages. We'll see how they can be used to display data, such as product listings, class schedules, or employee lists. We'll learn how to work with the contents of tables, how to change formats, alignment, colors, and more. You will learn how to insert and delete rows, columns, and edit the structure of a table. You will learn all about the Tables toolbar. You'll see how you can use the toolbar to insert rows & columns, delete cells, merge cells, adjust horizontal alignments, change background colors, and more. In the next lesson, you will learn how to edit Table Properties. We'll teach you how to edit the width of the table on the page - by a percentage of the window width or a fixed number of pixels. We'll also learn how to edit Cell Properties, including cell size, color, etc. You'll also learn a nifty feature called AutoFit to Contents. Then, we'll look at the more advanced table properties, such as cell padding, cell spacing, borders, and border colors. We'll teach you how to align your entire table vertically on the page (so you can center it, for example). You'll learn how to have text wrap around your table. Plus, you'll learn how to distribute column sizes evenly across your table. In the next lesson, you'll learn a lot of table tips and tricks. We'll show you how to merge cells, split cells, manually edit the cells of a table using the pencil and eraser tools, and create tables inside of other tables (nested tables). We'll show you how to edit table background colors, and how to split a large table into smaller tables. 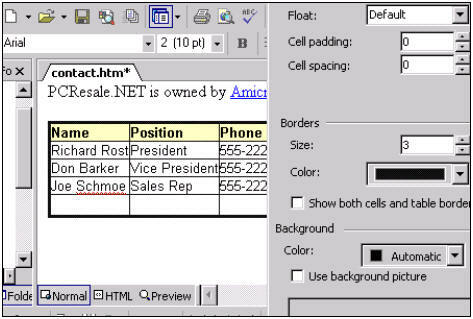 We'll also show you some advanced tricks to work with table and cell borders. Next we'll get into the real reason why you want to learn how to use tables: web page layout. 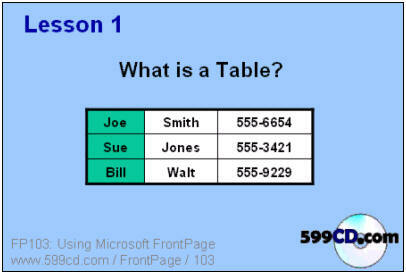 We'll construct a new home page using tables and the include page component we learned about in FP102. We'll teach you how to use WordArt briefly (we cover WordArt more in our Microsoft Word courses, but it can also be used in FrontPage). 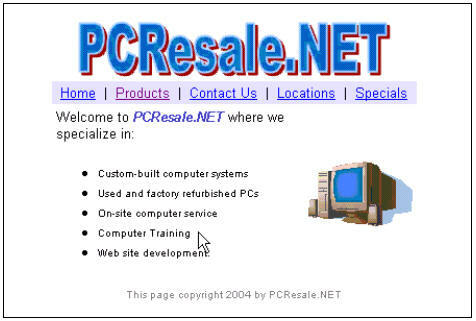 We'll create several new pages - a header page, a footer page, etc. and include them into our new home page. The final effect is a new home page laid out with Tables and constructed using easily changeable components. This class ties together a lot of the topics we studied in the last two FrontPage classes. After this class, you will now how to properly construct a web site using tables for layout and included page components for easy global site changes. Richard on 1/1/2007: Using Tables to display information and for Page Layout. Table & Cell Properties. Tips & Tricks. Home Page Redesign.